Dwarf Meyer Lemon | Gurney's Seed & Nursery Co.
A taste of the tropics! 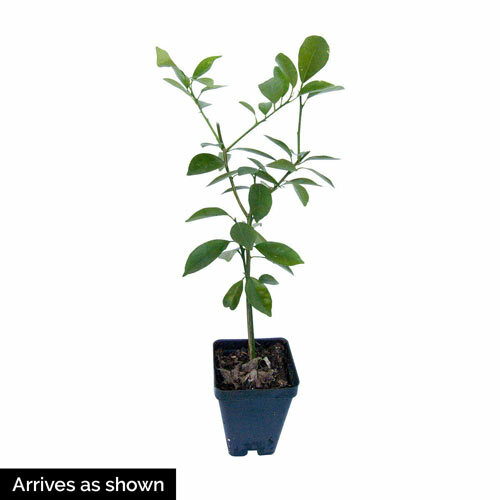 Dwarf citrus trees bear fragrant flowers followed by tasty fruit! Bears medium-size, round orange-yellow fruit year round (move plants indoors for winter in Northern zones.) Fruit is tangy, juicy and slightly sweet when fully ripe. Zones 9-10. Spacing1 plant per pot. If planted in the ground in zones 9 - 10, space 4 - 6 feet. Zones9 - 10 (30° F.). FruitMedium-sized, round, thin skinned, more orange colored, tangy, juicy, slightly sweet when fully ripe. 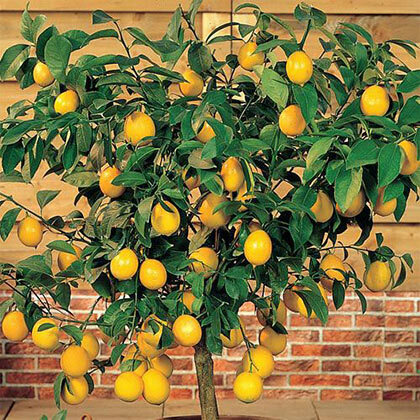 Fruit that is grown indoors in a pot can take up to a year for the fruit to ripen. Soil RequirementsWell-drained, rich, moist, sandy loam soil. PruningLate Winter pruning helps promote more compact look. PollinatorSelf-pollinating. Will need to hand-pollinate if indoors. CommentsNothing freshens the air like the pleasant fresh citrus fragrance given off by the beautiful, waxy white blossoms of these unique tropical plants. Move to a bright light indoors for the winter. Four hours or more of direct sunlight from a South window. Let plant approach dryness before watering. Average indoor humidity levels. Day temperature 65 - 70 degrees F; night temperature 50 - 55 degrees F. Use an acid-balanced fertilizer throughout the year and add trace elements in Spring. Leaves will drop if soil is too wet or too dry. High Ph or high soluble salts can cause leaf yellowing. Will not bloom if light is too low. May need to hand-pollinate for better fruit production. DepthPlant at the same level as in the pot.